Digital business accounts for nearly a quarter of the world’s economy today, and industry analysts expect that percentage to keep growing. But too many organizations still lack a complete, integrated view of the digital customer experience they’re delivering. That’s because IT teams and their business-side colleagues typically use separate approaches and tools to view, monitor, and measure the quality of that experience. As a result, nobody sees the big picture. That gulf in understanding hampers a company’s ability to optimize its digital outcomes and, ultimately, impedes its digital-business success. 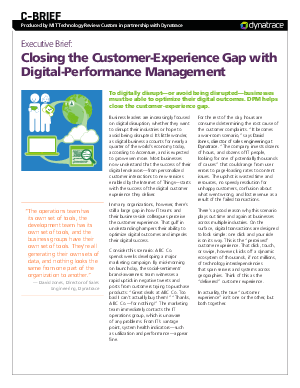 This exclusive report describes how to close the customer-experience gap through digital-performance management (DPM). It describes the benefits and potential challenges of this important emerging approach, and offers expert insights on getting started with DPM today.